There are many services we can provide, so if there is something specific you require, please feel free to contact us for a quote. Below is a brief summary for the most requested services. 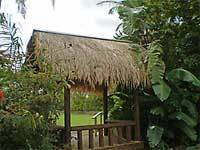 We have a large range of plants, shrubs, natives, ground covers, plams, cordylines and bromeliads to suit any type of garden. 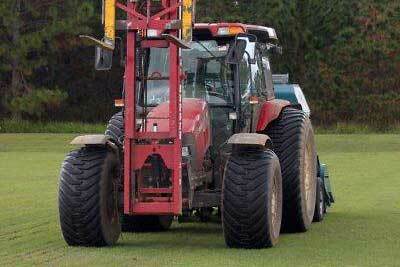 We can lay up to 7,000 meters of turf per day. There's no job too small or large. 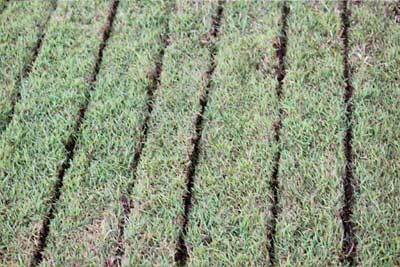 We'll lay turf for domestic yards of only 5 meters, to commercial sites of 30,000 meters. 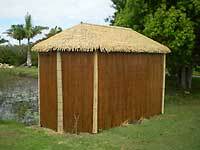 What ever your project size we can handle it. 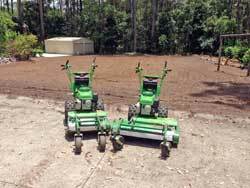 This is a well proved method of seeding turf and provides a very accurate seeding process. 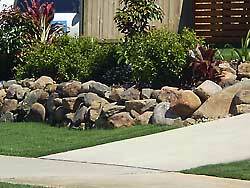 Domestic or Commercial, we can provide full landscaping services. 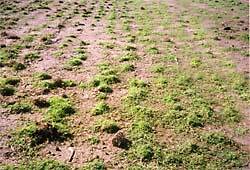 Need a new lawn. 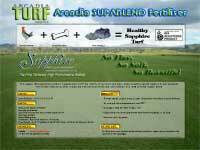 Arcadia can kill off and Power Rake your old compacted turf in while adding soil additives to improve the soil. 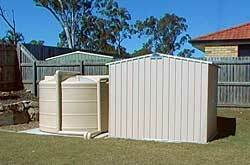 We can supply and install rainwater tanks, above ground or under ground. 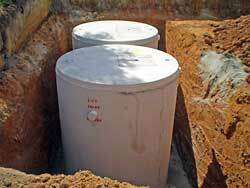 From 2,800 lt upto 1.5 million lt underground modular tanks. 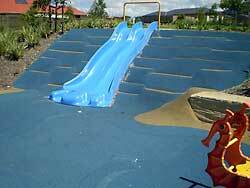 If you're looking for a soft and safe surface to use in childrens play areas, we have the perfect product. 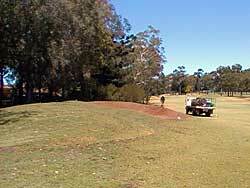 Here we are creating a new grass mound and bunker at the Redcliffe City Golf Course. 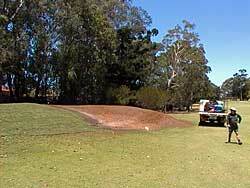 Another angle of the new grass mound and bunker we are creating for the Redcliffe City Golf Course. 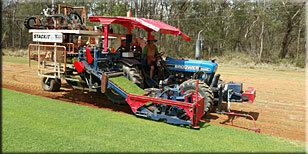 Picture of Turf being planted. 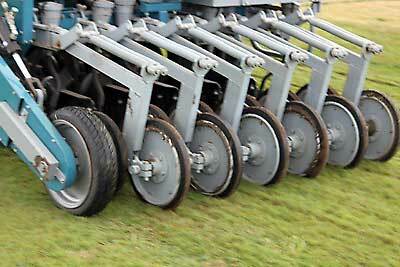 Our Planting technique has a 90% strike rate and we can plant 10,000 square meters per hour. Picture shows planting after 4 days. Using 10% planting material. 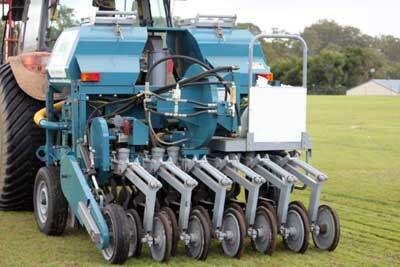 We can use 5% planting material if required. 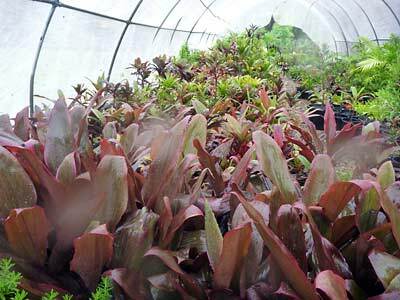 Our Deep planting technique requires less irigation to establish. 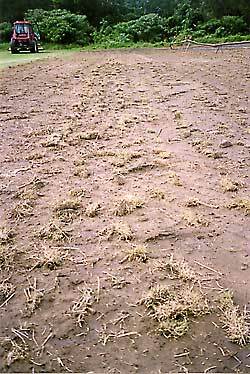 Picture shows same planting area after 4 weeks. 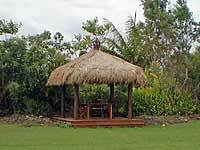 We can supply a large range of outdoor equipment. Water Saving/Storage Crystals can be inserted to a depth of 100mm. These crystals can increase in size up to 500 times allowing them to store a large amount of water. When the plant requires water, the crystals provide a slow release and won't flood the plant. 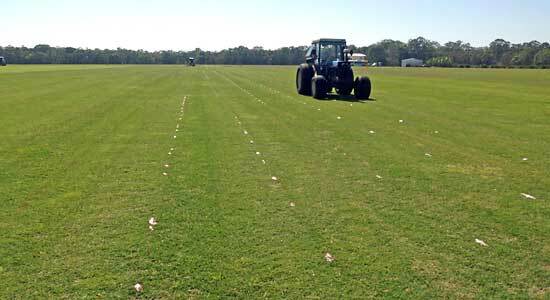 Crystals retain the water for long periods, which ensures that your turf, lawn or sports field will have access to water during droughts or inbetween irrigation periods, drastically increasing the plants survival rate. 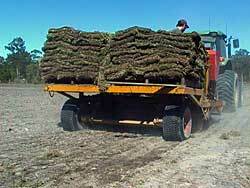 Sowing water crystals into the established ground root area, reduces water consumption and water evaporation. Reduce Water.. The use of water crystals to store water is one of the most effective ways to reduce water consumption. 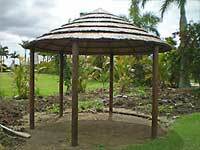 Increase Plant Surivival.. They are a boost for water conservation and plant health, helping to nurture plants by preventing stress both in drought and in times of excessive moisture.